Should I tell the GMC about my clinical negligence claim? People who make clinical negligence claims may want to inform the General Medical Council (GMC) about their concerns. Medical negligence solicitors can help claimants succeed in their cases, while the GMC’s Fitness to Practice hearings can decide whether or not a doctor is still performing competently. If the panels decide that a person appears to be unfit to practice, they can introduce sanctions. These can include suspensions of the doctor’s registration on the Medical Register, or even the total erasure of their name, which will mean they can no longer practice. They can also choose to take no action, to accept the doctor’s proposed undertakings so long as they will protect the public interest, or to add condition’s to the healthcare provider’s registration. As seen in medical negligence compensation cases, these panels will use the civil standard of proof to determine its judgements. This means that decisions will be made on the balance of probabilities, rather than requiring cases to be ‘proven beyond all reasonable doubt’ as seen in criminal courts. Many clinical negligence compensation claimants could benefit from making a complaint to the GMC – the organisation asks for anyone who is concerned that a doctor’s behaviour could put their patients at risk, or anyone who believes their doctor may be dishonest, to make a complaint to them. Complaints can also be settled by the doctor’s employers, and clinics, private hospitals, GPs and NHS hospitals frequently have internal complaints procedures. Recently, the GMC revealed it has implemented a series of new rules that should simplify and speed up its fitness to practice hearings. Some of the new regulations include enhancing arrangements that allow evidence to be submitted over the telephone or through video, ensuring that any witnesses have advanced warning that they need to deliver evidence, and removing the requirement for written allegations to be read out at the beginning of a case. There are a total of 15 new rules that have been brought in, which should reduce the amount of stress felt by involved parties, while simultaneously modernising the process. This should see fitness to practice panels improving and becoming more efficient, while simultaneously providing the highest standards of patient care. It should improve standards of decision making, strengthen the GMC’s case management and closely meet the needs of the public, patients and doctors. Last year, the GMC reformed the practice by setting up the Medical Practitioners Tribunal Service (MPTS), which now handles all fitness to practice hearings against doctors. The MPTS is an operationally separate part of the GMC with autonomous panels. The GMC has already informed any doctors who have clinical negligence claim hearings or other fitness to practice hearings that it has changed the service and has provided them with information about the new rules. GMC Chief Executive Niall Dickson explained that the group is determined to create a fair, efficient and modern system that does not get “bogged down” in any time-consuming, unnecessary or outdated procedures while still protecting the wellbeing of patients. However, there is still “more to do”, he added. Furthermore, MPTS and GMC are attempting to change the Medical Act, with their proposed amendments including allowing the GMC to appeal the decisions of the MPTS. These will be subject to a consultation by the Department of Health. 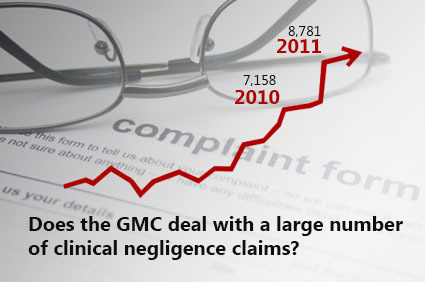 Does the GMC deal with a large number of clinical negligence claims? The most recent statistics available indicate that the GMC is dealing with more and more complaints than ever before. The number of complaints received by the organisation in 2011 reached 8,781, compared with 7,158 in 2010. This represents a 23% increase, showing that GPs are increasingly likely to face medical negligence claims. Men are also more likely to face complaints than women – despite the fact that just 57% of registered doctors are male, these individuals received almost 75% of all complaints. Specific specialities are also overrepresented in medical negligence compensation cases, and this is reflected by the GMC’s complaints figures. Although only 24% of those on the medical register are GPs, 47% of all complaints were made against these professionals. Those involved in surgery and psychiatry were also more likely to face complaints. These figures may indicate that patients are finding it increasingly easy to make complaints, and the recent rule changes to fitness to practice hearings could support this trend. Medical negligence solicitors can also help patients ensure their complaints are heard, and can support them in clinical negligence compensation cases.